Make the cashew cream sauce first and set aside. See recipe below. Heat a large pot over medium-high heat with olive oil. Add the garlic, onion, and celery and cook for 5 minutes. Add the mushrooms, thyme, white wine, and Worcestershire sauce. Cooking for another 5 minutes. While cooking the mushrooms, add the beans to a food processor or blender with 1 cup of vegetable stock and process until smooth. Add the mushroom mixture to the food processor and process until smooth. Return the mixture to the pot and add the remaining vegetable stock. Bring to a boil, reduce heat to low and simmer for 5 minutes. 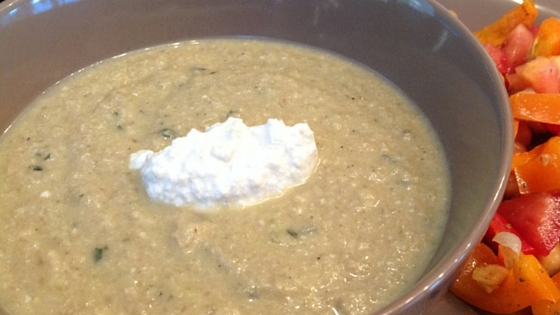 Ladle into soup bowls and top with a spoonful of Cashew Cream Sauce. Add cashews and water to a medium bowl. Cover and soak for 30 minutes, or overnight. Drain and rinse the cashews. Place in a blender with lemon juice and sea salt and blend until smooth.